For every fillet you can cut with a fork, there's also a shank so tough you'll have to take a circular saw to it. Regardless of how flavorful a cut of meat might be, it won't amount to much if you can barely chew it. When this happens, your meat will need to be thoroughly tenderized before you can eat it. But how do you go about tenderizing a cut of meat? Is there more than one way to make something more tender? What are you going to need to do it? These questions and more will be answered in this guide. To understand how to tenderize, you must first understand why meat is tough to begin with. In general, there are a few key ways in which meat becomes naturally tender, with the first being age. Simply put, age firms meat. The older the animal you're eating was, the tougher its meat will be. This is why the best cuts of meat always come from younger animals, with types of meat like veal and lamb are so highly prized for their flavor and softness. Additionally, exercise can toughen meat. The more a muscle is used, the firmer and stronger it becomes. This carries over once an animal has been slaughtered, with cuts that come from areas of high activity like the legs of diaphragm being extremely tough compared to the rarely used muscles along the back. Finally, overcooking is one way to ruin any piece of meat no matter how tender it is normally. Cooking meat causes the proteins within to become firmer, meaning the longer a piece of meat is cooked the tougher it becomes (in general, as a few exceptions apply that we'll discuss shortly). Longer cooking also forces moisture out of the inside of the meat, causing it to dry out if not kept moist during the cooking process. This is one of the reasons why most experienced chefs prefer rarer meat to well done. To tenderize meat, you'll need some specific equipment. What this equipment is, however, can differ depending on which method you use. 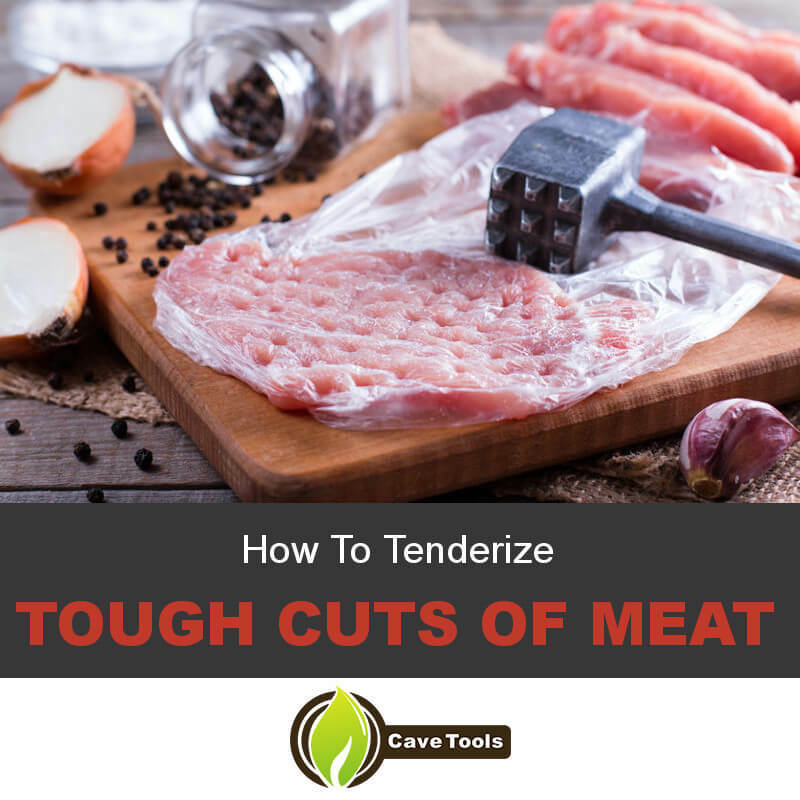 For convenience, the materials needed to tenderize cuts of meat using each method presented will be listed down below prior to explaining the techniques involved. Plastic wrap (for easy cleanup). Cooking tough meat slowly over long periods of time is a great way to soften it up, though you will need to introduce a lot of flavor and moisture to keep it from drying out. In order to do this, you'll need a few more specialized and technological ingredients compared to other methods and will differ quite dramatically depending on the cooking method you employ. Sharp knife (for trimming fat and silverskin). Carving fork (for larger pieces of meat). Acidic substances (citrus juices, lemon juice, buttermilk, etc.). Natural enzymes that break down protein (papaya juice, pineapple juice, etc.). Large plastic bag or container for marinading. 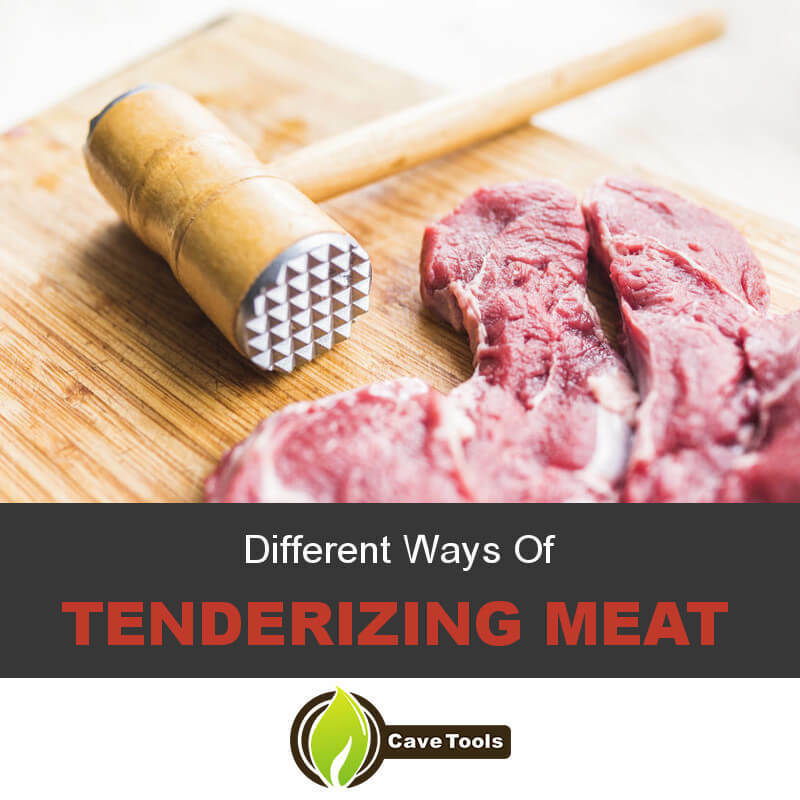 Now that you know what kind of tools you'll need to do the job, you can follow along with the method for tenderizing that you like the best. When pounding meat, it's important to focus on control. Strike the meat firmly with the pointed end of the mallet while applying only as much force as necessary to flatten the meat. Remember, you're tenderizing not pulverizing. To help with cleanup, set a piece of plastic wrap under and on top of the meat to keep your surfaces and mallet clean. You can also use a textured board to tenderize both sides of the meat at once. The major advantage to pounding out tough meat is the ability to quickly and easily break up a lot of the connective tissue within the meat. While it will have a hard time getting deep into the meat, this method will provide satisfactory results in most situations. It also flattens the meat out to help it cook more quickly and evenly, though you should be careful not to pound it too thinly. Effective slow cooking takes place over several hours. There are a multitude of ways to do this, whether it be barbecuing, braising, stewing, or more, though they all typically involve some method of retaining moisture within the meat despite it cooking for as long as it does. The basic premise behind this method involves melting the collagen (the tough connective tissue within meat) with the prolonged heating. When this happens, the collagen melts into gelatin, a sticky, moist substance that coats the meat inside and out to help it keep from drying out. Properly slow cooked meat is tender and flavorful despite being cooked well done. A way to ensure that the meat won't dry out is to cook it in liquids (braising, stewing) or by basting or otherwise wetting the surface of the meat as it cooks (barbecuing). This, in addition to the gelatin, should result in a deliciously supple and flavorful dish. To properly cut meats to maximize their tenderness, you always want to cut against the grain (the opposite direction that the natural lines in the meat travel). The grain indicates the way in which the majority of the collagen within the meat is directed, so cutting with it will ensure that the strands of collagen remain mostly intact. By cutting thin slices against the grain with a sharp knife on a cutting board, however, you manually tear apart the collagen strands within the meat, making for an easier time chewing the meat. This technique works well with naturally tougher cuts of meat like skirt steak and bottom round, though it can also be used to enhance an already tender piece of meat. Properly cutting your food can make the difference between a tough, chewy mess and a delicious dinner, with the results seeming like night and day. As mentioned before, the act of marinading meat itself won't help it to become more tender. Marinading with certain ingredients, however, can have this effect. Acids, for example, are good at breaking down proteins. If left to sit in even a mildly acidic solution for long enough, a piece of beef would fall apart. Essentially, this is what we intend to replicate on a more controlled scale. Adding in acidic ingredients like citrus or buttermilk to a marinade tenderizes while adding more flavor. The same principle applies to naturally occurring enzymes like bromelain, which essentially pre-digest meats that soak in them. It's important not to over-marinade the meat when utilizing acids or enzymes, though, as soaking for too long in protein-tenderizing substances can cause proteins to become a little too tender. Softer meat is ideal, but not so soft that your steak falls apart into a mushy pile. Salting meat is a given when it comes to cooking, but salt itself can also be used as a way to tenderize the meat prior to cooking. Coating meat heavily in salt, either with its mineral form or dissolved as a brine, can break down the proteins within meats, tenderizing them over several hours. Additionally, when finished, the outside of the meat will be much drier than it was before, leading to a much better sear on the surface. Before cooking with a piece of meat that's been brined, though, you need to make sure you've washed off the excess salt with clean water first. While salted meat should be the end result, the brining process uses far too much salt to simply leave on a cut of meat. Clean off the surface of the meat, pat it dry with paper towels, then reseason as needed to ensure your extremely tender cut of meat isn't a horribly salty disappointment. You now have the skills to fix up any cut of meat you could want so that it's as tender and delicious as a fillet. The secret is to break the tough muscle fibers. With so many different methods to choose from, there's sure to be one that fits your cooking style and the dish you want to prepare. No longer will you have to suffer a tough and uncomfortable meal with a disappointing steak, as you can easily and skillfully tenderize it in an instant. Have any tenderizing tips you want to share? Leave a comment about it down below. And if there's anyone in your life who might need some help learning how to prepare their meat, give this guide a share. How Do You Make Meat Tender? In this article, we explain exactly how to make meat tender! Our favorite techniques are pounding, slow cooking, thinly slicing, marinating in acids and enzymes, and salting. Read above for the details on each of these techniques. How do You Use Meat Tenderizer Powder? Meat tenderizer powder uses an enzyme powder (usually papain, which comes from papayas) to break down the protein structure in a piece of meat. Just before cooking, sprinkle some tenderizer over the meat. A good rule of thumb is 1 teaspoon powder for every pound of meat. 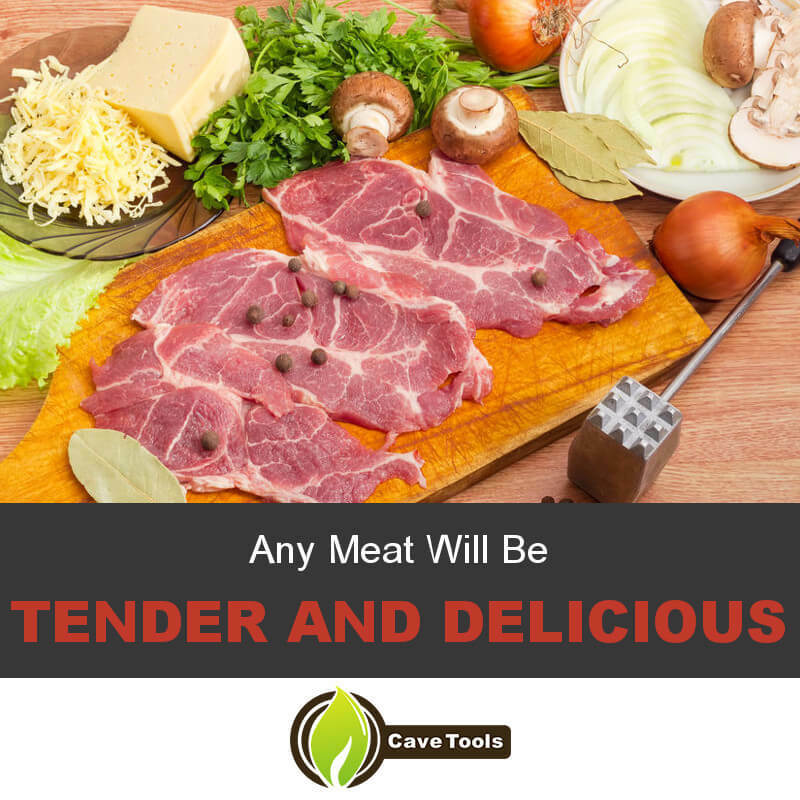 What Can You Use as a Natural Meat Tenderizer? Papaya and pineapple contain natural enzymes that rapidly break down the protein structure in meats. You can also use black tea (which contains tannins) or acidic ingredients (like wine, citrus or vinegar). Beer and buttermilk (or yogurt) are also popular natural tenderizing ingredients. 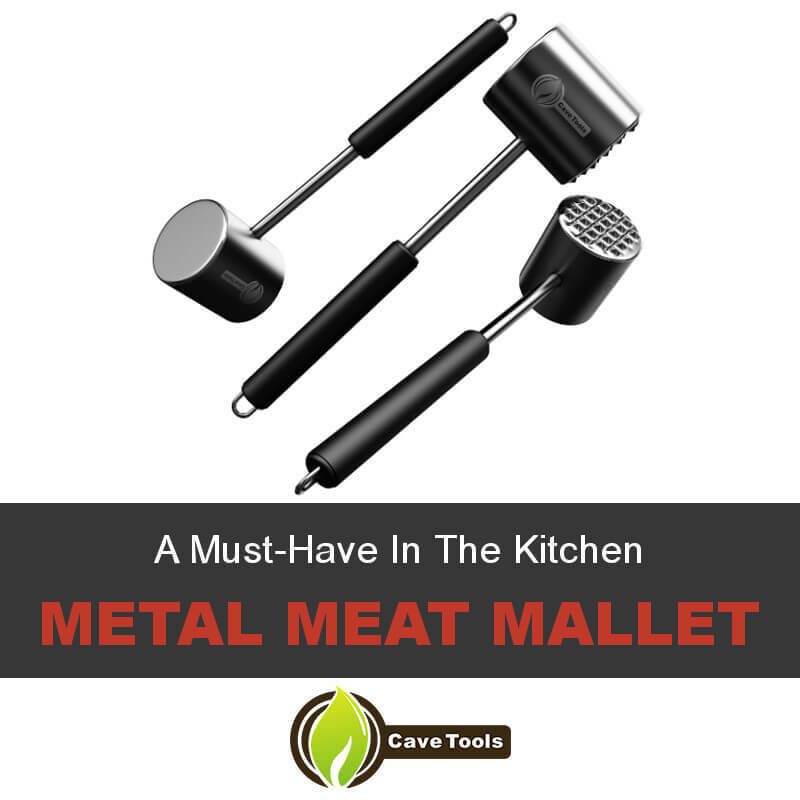 Do You Need a Mallet To Tenderize Meat? No, a mallet might make it easier to pound meat to the desired thickness, but it is not strictly required. You can place the meat between two pieces of plastic wrap and use a rolling pin, or the bottom of a heavy pot or pan, to pound out the meat. How Long Do You Leave Meat Tenderizer On? Powdered meat tenderizer works very quickly, so you should only need 30 minutes when using an enzyme. If you are using citrus or other acidic ingredients, it can stay on for a few hours. Salt by itself can go as long as 24 hours.